Cardboard is meant to box things up with, make toy houses out of, and maybe even a cardboard car, but a boat? Yes, a cardboard boat. Sounds like a soggy mess, but it is indeed happening at the pool. 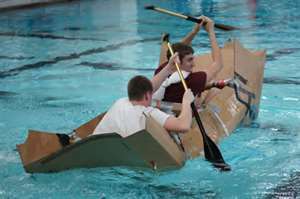 Teams have come together to build cardboard boats to race tonight at 7pm. Come out and cheer them on as they race to the finish line and see if they float or sink.